If you want to know how many calories you should eat per day to lose weight, build muscle, or maintain your weight, you want to read this article. The easiest way to know how many calories you should eat to lose, gain, or maintain your weight is to use a science-based calorie calculator (like you’ll find in this article). To lose weight, you should eat around 10 to 12 calories per pound of body weight per day, to maintain your weight you should eat around 14 to 16 calories per pound, and to gain weight you should eat around 16 to 18 calories per pound. To maximize fat loss while cutting and muscle gain while lean bulking, you should optimize your calorie intake in terms of protein, fat, and carbs. Want to understand how this calculator works and how to use it to create meal plans that will help you lose fat, build muscle, or maintain your weight with ease? Keep reading! The fact that you clicked into this article tells me some important things about you. When you ask a question like “how many calories should I eat a day,” it tells me that you’re looking for the real information on dieting. It tells me that you know, or at least suspect, that calorie intake matters, regardless of how “clean” your diet is. You also probably know there aren’t any quick fixes or magic bullets for fat loss or muscle gain. I’d even wager that you know at least a little about the basic principles of energy balance and how it drives weight loss and gain. In other words, you probably understand the importance of eating the right number of calories per day for your goals. What’s the right number though and why? Many people think you should eat around 2,000 calories per day to maintain their weight, less than that to lose weight, and more to gain weight. This can work for some people but not all. For instance, a sedentary, 100-pound woman may need significantly less than this to maintain her weight, while a very active, 200-pound man may need almost double this number to maintain his. The question, then, is how to optimize your calorie intake for your specific goals, body composition, activity level, and preferences? The easiest way to do this is with a formula or calculator (like you’ll find in this article) that accurately estimates how many calories you burn every day. Then, you can subtract from, add to, or maintain that level of calorie intake to lose, gain, or maintain your weight as desired. And that’s what you’re going to learn in this article. What About the Quality of Your Calories? Imagine someone tells you that he wants to drive across the country without paying attention to his gas tank. He plans on stopping for gas whenever he feels like stopping, pumping as much as he feels like pumping, and driving as far as he feels like driving. And I would calmly gather up my toys and go play with someone else. When someone says he wants to lose or gain weight without paying attention to his calories, or says that calorie intake and expenditure have nothing to do with it, he’s being just as foolish. Is it possible to lose or gain weight without paying attention to your calories? Sure . . . to a degree. Can you rely on your body to tell you how much to eat based on your hunger and satiety? Yes, intuitive eating can also work. Can you lose weight by avoiding various foods or food groups? Of course. Here’s the only question that really matters, though: Is any of this likely to work well over the long term? And the answer is absolutely not. The bottom line is calorie planning and tracking is the most reliable and effective way to lose fat and build muscle. And if that statement conjures haunting specters of starvation dieting and food deprivation in your mind, don’t worry. This isn’t that kind of party. I’m not going to recommend very low-calorie or highly restrictive dieting. Instead, I’m going to show you how to free yourself to get the body you really want eating foods you actually like. I’m going to show you how to make guaranteed progress toward your goals each and every week. That means no more hoping that you can make it happen. Knowing. And yes, it all starts with calories. Well, actually, with how the calories you eat relate to the calories you burn . . . otherwise known as energy balance. Energy balance refers to the relationship between the amount of energy you eat and the amount you burn. If you eat more energy than you burn, you’re in a positive energy balance. If you eat less than you burn, you’re in a negative energy balance. This energy that you eat and burn is measured in calories. When we’re talking food and metabolism, a calorie is the amount of energy required to heat one kilogram of water one degree Celsius. Thus, foods with a lot of calories (butter) contain a lot of potential energy and foods with fewer calories (green beans) contain less. Meaningful weight loss requires consistently eating less energy than you expend and meaningful weight gain requires eating more. This isn’t news, either. After a century of metabolic research and anecdotal evidence, there’s no room left for argument. Energy balance alone dictates weight loss and gain, not food choices, eating schedule, the pH of your water, or any other factor. In this sense, a calorie is a calorie, and if you eat too much of the “cleanest” foods in the world, you’ll gain weight. On the flip side, restrict your calories (maintain an energy deficit) while eating the most nutritionally bankrupt crap you can find, and you’ll lose weight. This is why Mark Haub, a professor at Kansas University, was able to lose 27 pounds on a diet of protein shakes, Twinkies, Doritos, Oreos, and Little Debbie snacks, and how John Cisna, a high school teacher in Iowa, dropped 56 pounds eating nothing but McDonald’s for six months. They simply ate fewer crappy calories than they burned for a long enough period of time, and as the first law of thermodynamics dictates, this resulted in a reduction in total fat mass. Now, that doesn’t mean that you should try to do the same thing. The nutritional value of your food does matter when it comes to your long-term health, happiness, and well-being, but it simply isn’t that important when it comes to weight loss. Summary: Energy balance is the relationship between how many calories you eat and how many you burn, and this alone dictates whether or not you gain or lose weight. Energy balance is usually described as “calories in vs. calories out,” and while it’s the basis of all successful dieting, it’s not the whole story and especially if you want to build an outstanding physique. When it comes to improving your body composition—what your weight is comprised of, and especially in terms of muscle and fat—a calorie is not a calorie. Eating like Professor Haub or Mr. Cisna won’t cut it. When you want to build muscle and lose fat (or minimize fat gain), your food choices matter. Not the specific foods per se, but how they break down into protein, carbohydrate, and fat. When people say they want to lose or gain “weight,” they usually mean is they want to lose fat or gain muscle. And when that’s the goal, some types of calories are now much more important than others. For example, gram for gram, protein contains about the same number of calories carbohydrate (~4), but is far more important for building muscle and losing fat. And carbohydrate, in turn, is more important in this regard than dietary fat. Let’s learn a bit about each. The calories you get from protein are, in many ways, far more important for your body composition than those you get from carbohydrate and fat. A high-protein diet is better for building muscle. Summary: Following a high-protein diet helps you lose more fat and less muscle and stave off hunger while dieting. If you don’t know whom to believe in the “carbohydrate wars,” I understand. It’s easy to get lost in the tempest of debate, name-calling, and general hysterics. Many “experts” say that low-carb dieting is the only reliable way to get lean and muscular . . . and people like me say the opposite—that a higher-carb diet is probably going to suit your needs better. If you’re healthy and physically active, and especially if you lift weights regularly, you’re probably going to do best with more carbs, not less. That advice applies to both building muscle and losing fat, as well. High-carb dieting offers many benefits for both. The simplest way to set your daily carbohydrate intake is to first set your protein and fat intake, and then fill in the rest of your calories with carbs. You’ll learn how to do this in a moment. Summary: If you’re healthy and active, especially if you lift weights regularly, you’re probably going to do best with eating more carbs, not less. One of the many ways to sell products and ideas is to be contrarian. When everyone is leaning left, lean right and people will take notice and listen to what you have to say. Not so long ago, low-fat dieting was the undisputed champion of weight loss nutrition. “Eat fat and get fat” was the mainstream mantra. That strategy didn’t pan out, and with everyone zigging, it was only a matter of time before smart marketers started zagging. The truth is all forms of dietary extremism are inherently flawed. Black and white, binary thinking is easy on the ol’ grey matter but isn’t conducive to good decision making, and especially when we’re talking diet and health. There is no One True Diet that’s best for everyone under any and all circumstances. There are non-negotiable fundamentals like energy balance and nutritional requirements that must be observed, and there are negotiable (flexible) guidelines that can be molded to fit personal needs. Dietary fat intake is one of those malleable factors. There’s no denying the nutritional value of dietary fat, of course—it’s involved in many vital physiological processes including cell maintenance, hormone production, insulin sensitivity, and more. This is why the Institute of Medicine (IoM) recommends that dietary fat should comprise 20 to 35% of an adult’s daily calories. That said, those percentages were worked out for the average sedentary person, who often eats quite a bit less than someone that exercises regularly (and especially if that person has a lot of muscle). Now, I weigh 195 pounds, but I also have a lot more muscle than the average person and I exercise fairly intensely about 6 hours per week. Thus, my body burns about 3,000 calories per day, and if I were to blindly apply the IoM’s research to that number, my recommended fat intake would skyrocket to 65 to 115 grams per day. But does my body really need that much more dietary fat simply because I’m muscular and burn a lot of energy through regular exercise? Research conducted by scientists at Auckland University of Technology (including Eric Helms, a member of Legion’s Scientific Advisory Board) shows that you only need about 0.2 grams of fat per pound of body weight per day to maintain your health, and there are few benefits in eating more than 0.3 grams per pound of body weight. This is particularly true if you get the majority of your dietary fat from optimal (unsaturated) sources, including a healthy dose of monounsaturated fat in particular. Summary: When dieting to lose fat, you’ll generally get the best results by eating 0.2 to 0.3 grams of fat per pound of body weight, and eating more than this offers few to no benefits. Now that you understand the fundamentals of proper dieting (energy and macronutrient balance), let’s talk about how to figure out how many calories you should be eating and how they should break down into protein, carbs, and fat. The first step is determining approximately how much energy you’re burning every day, which is referred to as your total daily energy expenditure or TDEE. Once you have a good handle on your TDEE, you can adjust your calorie intake down or up to lose or gain weight as desired. Your TDEE is comprised of your basal metabolic rate (BMR) plus the additional energy you burn through physical activity and the food you eat. No matter how large or small or long or short an activity is, it burns energy. This is why “fidgety,” high-activity people can burn significantly more energy than low-activity types and have an easier time losing and maintaining weight. This is known as the thermic effect of food, or TEF. Research conducted by a scientist at the University of Lausanne shows that TEF accounts for about 10% of our total daily energy expenditure and varies based on the macronutrient composition of our diets. So again, when you sum the energy your body burns to stay alive (BMR) and the energy burned through physical activity and digesting and absorbing food, you arrive at your TDEE. If that sounds complicated, don’t worry. It’s not. You don’t have to dust off your college algebra or take an Excel class. This matters because muscle is more metabolically active than body fat, so two people at the same body weight can burn significantly different amounts of energy while at rest. The second step is accounting for additional energy expenditure. It’s almost as accurate as the complex way. It gives you what you need to get the results you want. In other words, unless you’re a natural competitive bodybuilder trying to dial in everything as tightly as you can, you just don’t need to get fancy with estimating your energy expenditure. Here, “good enough” will do just fine. The Katch-McArdle equation can give us that because it includes multipliers we can apply to our BMR based on our general activity levels. This gives us a fairly accurate starting point, and we can then adjust our intake up and down as we see how our body responds. So, if you did little or no exercise, you would multiply your BMR by 1.2 and have a fairly accurate guess of how many calories you’re burning every day. There’s a problem with these multipliers, however: They will probably overestimate the actual amount of energy you’re burning every day. I don’t have any research to cite that backs that statement up, but I’ve worked with thousands of people and consistently found it to be the case. It’s also common knowledge among experienced bodybuilders. Simply put, if you use the standard multipliers, you’ll probably place yourself in too small of a calorie deficit when cutting (resulting in less-than-optimal fat loss) and too large of a surplus when bulking (resulting in more-than-optimal fat gain). This is why I recommend you just use lower activity multipliers when calculating your TDEE. These multipliers will give you a more accurate starting point, and they’re what I used to create the calculator you saw at the beginning of this article. Then, as noted above, you adjust your intake based on how your body actually responds. Finally, I want to share one more TDEE formula with you, which is the one that I currently use with my clients and recommend in my books for men and women. This may seem too simplistic at first glance, but it’s what most people “in the know” use to set their maintenance calories because it produces results almost identical to the most evidence-based methods of calculating TDEE. In other words, it’s a shortcut that actually works. For example, according to the Katch-McArdle calculator with my upgraded activity multipliers, my TDEE is approximately 2,930 calories. And if I use the simple formula of 14 to 16 calories per pound, it gives me a TDEE of 2,730 to 3,120, with the average being 2,925—almost exactly the same as the Katch-McArdle formula. Another benefit of this shortcut is it doesn’t require you to estimate your body fat percentage, which most people can’t do accurately. If you’re a woman or slight-framed man, new to lifting weights (average or below-average amount of lean mass), and/or you work out less than 3 hours per week, go with 14 times your body weight (in pounds). Whether you’re a man or woman, if you’ve got two to three years of lifting under your belt (above-average amount of lean mass), and/or you workout 3 to 6 hours per week, then go with 15 times your body weight. If you’re a man, you’ve got 4+ years of lifting under your belt (very high amount of lean mass), and/or you work out 6+ hours per week, then go with 16 times your body weight. Also, keep in mind that no matter how you calculate your TDEE, it’s just a starting point. You’ll most likely need to adjust your calorie intake based on how your body actually responds. You can also easily tweak this formula to set your cutting or lean bulking calories, which you’ll learn how to do next. Summary: To maintain your current body fat level, eat 100% of your TDEE every day. A fast, easy, and effective way to calculate your daily maintenance calories is to multiply your body weight (in pounds) by 14 to 16 (I typically split the difference and multiply by 15). You want to know how much you should eat to lose weight. In other words, should you eat 90% of the calories you burn every day? Eighty percent? Less? Some fitness folk advocate a “slow-cutting” approach where you use a small calorie deficit and lax workout schedule to whittle down fat stores over the course of many months. Slow cutting is at least slightly easier and forgiving in some ways than a more aggressive approach, but the upsides aren’t all that significant for most people, and they come at a steep price: duration. For instance, all things being equal, by reducing your calorie deficit from 20 to 10%, you’re halving the amount of fat you’ll lose each week and doubling the amount of time it’ll take to finish your cut. This is a problem for many because the longer they remain in a calorie deficit of any size, the more likely they are to fall off the wagon due to life commotion, dietary slipups, scheduling snafus, and so on. Therefore, my recommendation is an aggressive but not reckless calorie deficit of about 25% when cutting. I didn’t pick this 25% number out of thin air, either. Research shows it works tremendously well for both fat loss and muscle preservation when combined with resistance training and high protein intake. Group one maintained a 300-calorie deficit (about 12% below TDEE). After four weeks, the first group lost very little fat and muscle, and the second group lost, on average, about four pounds of fat and very little muscle. And neither group experienced any negative side effects to speak of. When combined with a high-protein diet and rigorous workout routine, a calorie deficit of about 25% allows for speedy fat loss and (sometimes) considerable muscle gain without any serious side effects. You can calculate this number by multiplying your TDEE from the calculator by 0.75, or you can use the back-of-the-envelope method of . . .
As with the maintenance shortcut, this simple formula will give you a nearly identical number without the hassle of using a TDEE calculator for weight loss. If you’re a woman, new to lifting weights, and/or you work out less than 3 hours per week, go with 10 times your body weight (in pounds). If you’re a man or woman, you’ve got two to three years of lifting under your belt, and/or you workout 3 to 6 hours per week, go with 11 times your body weight. If you’re a man, you’ve got 4+ years of lifting under your belt, and/or you work out 6+ hours per week, go with 12 times your body weight. For example, using the TDEE calculator, we established my TDEE is about 2,900 calories, so when I cut, I should drop my calories to about 2,200 (2,900 x 0.75). Almost exactly what I get when I multiply my TDEE by 0.75. Summary: To lose fat as quickly as possible without sacrificing muscle, eat 75% of your TDEE every day. A fast, easy, and effective way to calculate your daily cutting calories is to multiply your body weight (in pounds) by 10 to 12. When you want to lose fat as quickly as possible, you have to get both your calories and “macros” right. Eat 1 to 1.2 grams of protein per pound of body weight per day. If you’re very overweight (a man with 25%+ body fat or a woman with 30%+), I recommend you set your protein intake at 40% of your total daily calories. If you exercise regularly and don’t have any medical conditions, eat 0.2 to 0.25 grams of fat per pound of body weight per day. This gives your body what it needs for general health and leaves plenty of calories for carbs. Yes, that means you get to enjoy a fair amount of carbs every day, and no, that isn’t going to impair your fat loss. You’re also going to benefit in a number of other ways, including better workouts, better energy levels, better mood, and more. Experience it for yourself and you’ll never look back. Now, to calculate this, you first multiply your protein intake (in grams) by 4 and your fat intake (in grams) by 9, and subtract the result from your total daily calories. This gives you the amount of calories you have for carbs, because one gram of protein contains approximately 4 calories and one gram of fat contains approximately 9. Next, you determine how many grams of carbs you can eat per day by dividing the amount of calories you have for carbohydrate by 4, because one gram contains about 4 calories. If you have a medical condition like diabetes or are extremely overweight (BMI over 30), you may want to experiment with eating fewer carbs. Most research shows that people who fall into these categories can still lose weight just as efficiently while following a high-carb diet, but in these cases, losing weight and maintaining a healthy weight are more important than maximizing workout performance. If going low-carb helps you accomplish that goal faster, there’s nothing wrong with it. Let’s see how this math would play out for me if I were cutting. I currently weigh 195 pounds, so that would mean . . .
My final macros would be . . . If I stuck to those numbers consistently, I’d lose weight every week without fail, and you can do the same when you set your calories and macros. Summary: When cutting, eat 1 to 1.2 grams of protein and 0.2 to 0.3 grams of fat per pound of body weight per day, and get the rest of your calories from carbs. In order to maximize muscle and strength gain, you need to maintain a calorie surplus. While building muscle and losing fat at the same time is possible for some people some of the time, it’s mostly limited to people new to weightlifting (newbie gains) or getting back into lifting after an injury. For the rest of us—people who’ve been lifting consistently for more than 6 to 12 months—maintaining a calorie surplus is required to gain muscle and strength as quickly as possible. The reason for this is an energy surplus optimizes your body’s “muscle-building machinery,” so to speak, greatly enhancing your body’s ability to recover from and positively adapt to your training. That said, it doesn’t take a large calorie surplus to accomplish this, and if you eat too much food, it no longer accelerates muscle growth but fat gain instead. That’s why I recommend a mild calorie surplus of about 10% when in a “gaining” or “lean bulking” phase. In other words, I recommend that you eat about 110% of your TDEE every day to gain muscle and not fat as quickly as possible. I should also mention that I don’t recommend lean bulking unless your body fat percentage is in the right range. If you’re a guy, you want to start your lean bulking around 10% body fat, and if you’re a woman, you want to start around 20%. For me, this would mean eating about 3,200 calories per day (2,900 x 1.1), which is exactly what I do when lean bulking, and it results in slow and steady muscle gain with minimal fat storage. If you’re a woman, new to lifting weights, and/or you work out less than 3 hours per week, go with 16 times your body weight (in pounds). If you’re a man or woman with two to three years of lifting under your belt and/or you workout 3 to 6 hours per week, go with 17 times your body weight. If you’re a man, you’ve got 4+ years of lifting under your belt, and/or you work out 6+ hours per week, go with 18 times your body weight. From experience I know this is a little high for me, so I typically go with the more conservative multiplier of 16 calories per pound of body weight per day. Again, almost exactly what I get when I multiply my TDEE by 1.1. Summary: To gain muscle and strength as quickly as possible without getting fat, eat 110% of your TDEE every day. 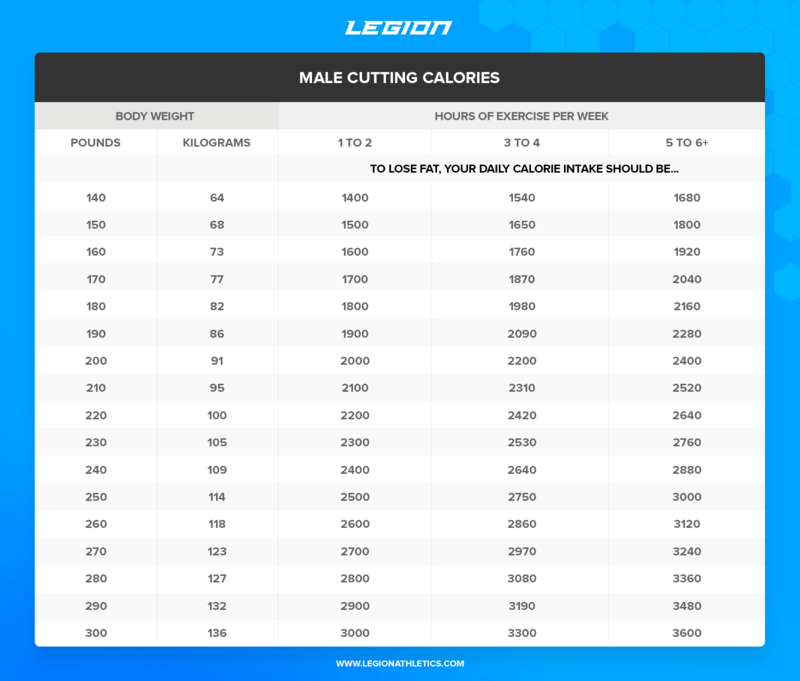 A fast, easy, and effective way to calculate your daily lean bulking calories is to multiply your body weight (in pounds) by 14 to 16. When your goal is maximum muscle growth, you want to set your macros up a little differently than when you’re maintaining or cutting. Eat 0.8 to 1 grams of protein per pound of body weight per day. Eat 0.25 to 0.3 grams of fat per pound of body weight per day. This gives your body everything it needs health-wise, and leaves a large amount of calories for carbs. This high-carb approach is going to benefit you in a number of ways: you’re going to have better workouts, your body is going to recover from them better, and your physiology is going to be conducive to muscle and strength gain. Let’s see how this math would play out for me if I were lean bulking. I currently weigh 195 pounds, so that would mean . . .
And that’s exactly what I do when lean bulking, and it allows me to consistently gain muscle and strength without much in the way of fat gain. Summary: When lean bulking, eat 0.8 to 1 gram of protein and 0.25 to 0.3 grams of fat per pound of body weight per day, and get the rest of your calories from carbs. The cult of “clean eating” is more popular than ever these days. While I’m all for eating healthful, (“clean”) foods for the purposes of supplying our bodies with vitamins, minerals, and other important nutrients, this guarantees nothing in the way of muscle gain or fat loss. The bottom line is you can be the cleanest eater in the world and still be weak and skinny fat. When it comes to body composition, how much you eat is more important than what. In this sense, “healthy” calories count just as much as “unhealthy” ones because that dimension of dieting is ruled by numbers—by calories and macros. That said, while the quantitative elements determine how you look, they guarantee nothing in the way of nutrition and health, because that is mostly influenced by the quality of your food choices. Thus, the middle of the spectrum is the place to be. When you want to lose weight, you need to consistently eat less energy than you burn. When you want gain weight, you need to consistently eat more energy than you burn. Eat 75 to 80% of your TDEE, or 20 to 25% less energy than you burn every day. This will generally be about 10 to 12 calories per pound of body weight per day. Eat 0.2 to 0.25 grams of fat per pound of body weight per day. Start your lean bulk around 10% body fat if you’re a man, and around 20% body fat if you’re a woman. Eat 110% of your TDEE, or about 10% more energy than you expend every day. This will generally be about 16 to 18 calories per pound of body weight per day. While I didn’t go into it in this article, it’s important to remember that diet isn’t the only factor that dictates fat loss and muscle gain. Well, that’s all you need to know on how many calories to eat every day. Even if you’re still skeptical, give the advice in this article a go and within a couple of weeks, you’ll see real results in the mirror and on the scale. What’s your take on how many calories you should be eating? Have anything else to share? Let me know in the comments below!